The thin line between utopia and dystopia is a favorite subject of moviemaking. In The Purge, a future United States exists in a state of economic prosperity and civil peace, but at a price: for one twelve-hour period per year, emergency services are suspended, hospitals close down, and all crime is legal – even murder. 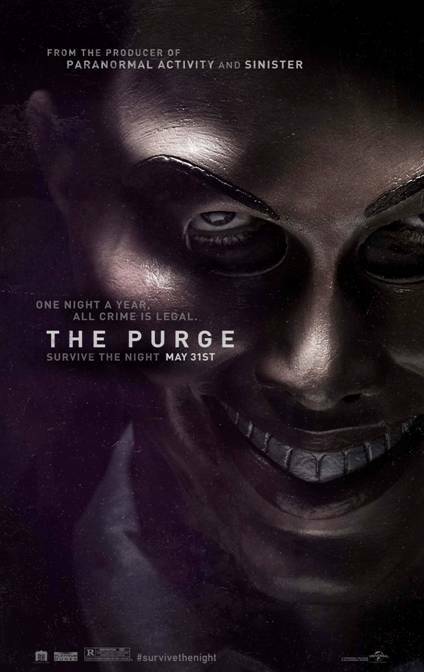 One upper-class family plans to ride out the night of The Purge from behind their armored doors and windows. However, a single impulsive act of charity exposes them to a night of chaos and bloodshed. The Purge is written and directed by James DeMonaco (Assault on Precinct 13). The film stars Ethan Hawke (Before Midnight) and Lena Headey (Game of Thrones). The cast also includes Edwin Hodge (Cougar Town), Max Burkholder (Parenthood), and Tony Oller (Beneath the Darkness). Though it frontloads a little bit too much detail about the film, the preview for The Purge is genuinely compelling and exciting. With a premise that could easily fall into eye-rolling ridiculousness, it's refreshing that the movie seems to take its time setting up the idea of a single lawless night as plausible. That said, it's difficult to discern whether The Purge will actually make good use of its interesting setting. The actual action of the film looks more than a little familiar – harkening to home-invasion thrillers like The Strangers and Funny Games. Hopefully, The Purge will embrace the potential of its premise and expand beyond the standard template for such movies. The Purge will invade theaters on May 31st, 2013.